Perhaps it’s reading too much into a story but when a journalist says that “…despite its magnificence the former stately home, built in 1653, is impractical as a hospice – haemorrhaging money, which could, and should, be spent on patient care.” does this indicate an intention to sell this important Grade-I listed house? And “…Thorpe Hall, however beautiful, is not an ideal site”. Perhaps the fact that the Sue Ryder Foundation, who own the house, have also launched an £8m appeal for a new hospice in the city is related? 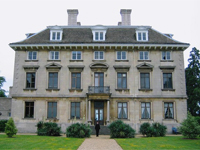 Thorpe Hall has the rare distinction of being one of the few houses built during the dark years of the Commonwealth when there was little building activity in England. Although an undoubtably beautiful house the “principal staircase with heavily carved foliated open panels to broad balustrade” is probably not suitable for a stairlift. Hopefully, the discussion and consultation process will be open as possible – the worst scenario would be for the hospice to move to a new location leaving this important building in a disused limbo. Here’s a thought though; rather than passing to another institutional use, it would be interesting to explore the possibility of it becoming a home again. This would be the least impact option in terms of long-term day-to-day use but would probably entail some covenants regarding the long-established access to the grounds and gardens. Anyway, it’s just a thought. This entry was posted in News and tagged architecture, cambridgeshire, conservation, country house, for sale, grade-i, heritage, houses, listed, peterborough, thorpe hall. Bookmark the permalink.